Looking for the best place to ring in the New Year on Monday December 31st ? The Oldest House front porch at 322 Duval is the place to be! Your ticket includes a delicious full-course, sit down dinner prepared by one of our favorite local restaurants, served under the lights in our private backyard garden. 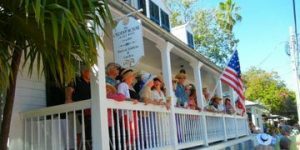 The porch will also be open to watch the revelers promenade on Duval Street. The open bar will be serving plenty of cocktails, beer and wine. Gates will open at 6:00 pm, dinner service starts at 8:15pm. We will also feature a live streaming of the ball drop in New York city where guests can view Times Square. This is an exclusive event! As such we can sell only a very limited number of tickets, so there will be no crowding. At $225 per ticket this is the best value on Duval St. You’ll also have access to clean and private restrooms all evening long. Our gates and bar open at 6:00 pm. Dinner service starts at 8:15 pm. We will keep the bar flowing until a quarter past midnight.